NGINX honeypot — the easiest and fastest way to block bots! NGINX honeypot — the easiest and fastest way to block bots! The Internet is not a safe place these days. Hosting a public website means exposing it to multiple attacks from evil bots, which, at best will cause extra CPU and I/O load to your server. If your web server is NGINX, you may be rightfully tempted to make use of some 3rd party WAF modules to counter the bad guys. One such module is nginx-module-security, other is NAXSI. But what if I told you that there’s a trick that would allow your NGINX to easily filter out 99% of the bots out there, without third-party modules? Read on to find out how. Those plugins most likely do not even exist on your website! 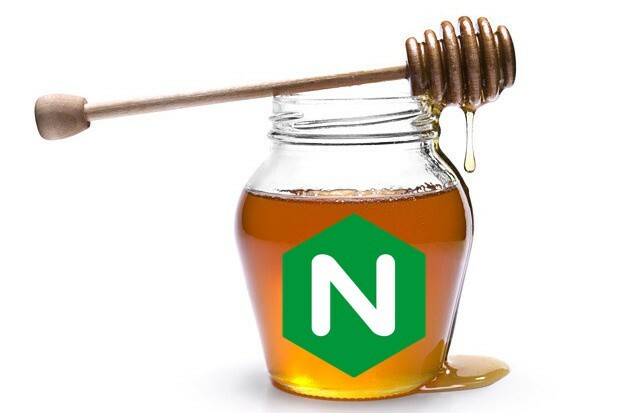 We will now add NGINX honeypot that will work in a simple and effective way: when a malicious bot requests a known, yet non-existent upload location, NGINX will immediately ban their IP. Let’s dive into implementation details for this kind of ban. We are going to create two FirewallD ipsets. The two ipsets’ names are honeypot4 and honeypot6, for IPv4 and IPv6 addresses, respectively. Any IP addresses placed to either of the two sets should be banned in the server firewall. To achieve this, we configure these ipsets to be in FirewallD’s drop zone. Next, we’ll teach our NGINX on when and how to add IP addresses to those ipsets. Our “trap” locations in NGINX will forward requests to a special FastCGI daemon powered by fcgiwrap. Each of those honeypot locations will include exactly the same directives to ensure passing requests to block-ip.cgi CGI script, that we'll create later. Using exact location matching via = ensures that matching is fast and has priority over your existing \.php location. The regex matching is prone to configuration errors because the position of these directives relative to other locations is important. Be sure to place your honeytrap regexes before your existing \.php location. The fcgiwrap is needed to empower our NGINX with ability to launch the bash script to ban IPs in firewall. Technically, you could use whatever existing scripting engine currently used for your website (PHP with Wordpress). But for efficiency reasons, let's avoid launching PHP interpreter for banning. The fcgiwrap conveniently ships with service file that allows us to launch multiple instances using different users. E.g. fcgiwrap@nginx.socket unit will launch fcgiwrap service with nginx user, and listen on a UNIX socket. Let’s create a CGI script at /usr/local/libexec/block-ip.cgi. Any time NGINX will call this script, this will launch sudo /usr/local/bin/block-ip.sh and pass along REMOTE_ADDR. Let’s create the bash script that will be launched by nginx via sudo, that will block an IP address. echo "Unrecognized IP format '$1'"
We could also use firewall-cmd to add to ipsets, but of course, we want to avoid the heavy lifting of the Python interpreter. On a 1 CPU VPS, firewall-cmd --ipset=honeypot4 --add-entry=... runs 0m0.494s while pure binary ipset add honeypot4 ... took only 0m0.002s to run! What else is missing? Surely enough nginx runs under non-privileged user and can’t sudo /usr/local/bin/block-ip.sh, yet. We want to allow nginx to gain privileges to run the script as superuser. Moreover, for security reasons, we will allow only REMOTE_ADDR environment variable to be passed while launching the script. ; tldr #2 — Evil bots don’t even know your domain name! Most of “current wave” bots will only know your IP, because they are scanning public IPv4 ranges and iterating one IP after another as their victim. So you can greatly reduce the load from those bots by blocking any client that does not provide valid hostnames. Obviously, valid hostnames are simply all domains that you host on your server, and any other domain would be an invalid hostname. With the configuration above, NGINX will check if the requested domain is in the list specified in nginx.conf. If there is no match, then 410 status code is returned, which is handled by the @honeypot named location, which, of course, launches our bash script for banning. Surely enough, you should not use this approach alone. There is never “enough security”, and you should use Fail2ban, Malware Detect, and ModSecurity. However, we can see how the honeypot approach can complement the mentioned tools, and soften their disadvantages. So other tools may be either slow or “too late”. They are surely enough useful. But now we can do better with additional security layer thanks to the NGINX honeypot approach.